Size and scale. Michael Reed memorably observed that the American Mathematical Society is about the same size as the American Society for Nephrology, “and that’s just the kidney”. Simply put: not many people care about mathematics. The British Ecological Society (BES) meeting had 1200 participants, which is about ten times bigger than the annual international category theory meeting, and still only a fraction of the size of the conference run by the Ecological Society of America. You may reply that the US Joint Mathematics Meetings attract about 7000 participants; but as Reed pointed out (under the heading “Most of Science is Biology”), the Society for Neuroscience gets about 30,000. Even at the BES meeting in our small country, there were nearly 600 talks, 70 special sessions, and 220 posters. In the parallel sessions, you had a choice of 12 talks to go to at any given moment in time. Concision. Almost all talks were 12 minutes, with 3 minutes for questions. You cannot, of course, say much in that time. With so many people attending and wanting to speak, it’s understandable that the culture has evolved this way. And I have to say, it’s very nice that if you choose to attend a talk and swiftly discover that you chose badly, you’ve only lost 15 minutes. But there are many critiques of enforced brevity, including from some very distinguished academics. It’s traditionally held that the most prestigious journals in all of science are Nature and Science, and in both cases the standard length of an article is only about three pages. The style of such papers is ludicrously condensed, and from my outsider’s point of view I gather that there’s something of a backlash against Nature and Science, with less constipated publications gaining ground in people’s mental ranking systems. When science is condensed too much, it takes on the character of a sales pitch. This is part of a wider phenomenon of destructive competition for attention. For instance, almost all interviews on TV news programmes are under ten minutes, and most are under five, with much of that taken up by the interviewer talking. The very design favours sloganeering and excludes all points that are too novel or controversial to explain in a couple of sentences. (The link is to a video of Noam Chomsky, who makes this point very effectively.) Not all arguments can be expressed to a general audience in a few minutes, as every mathematician knows. The pleasure of introductions. Many ecologists study one particular natural system, and often the first few minutes of their talks are a delight. You learn something new and amazing about fungi or beavers or the weird relationships between beetles and ants. 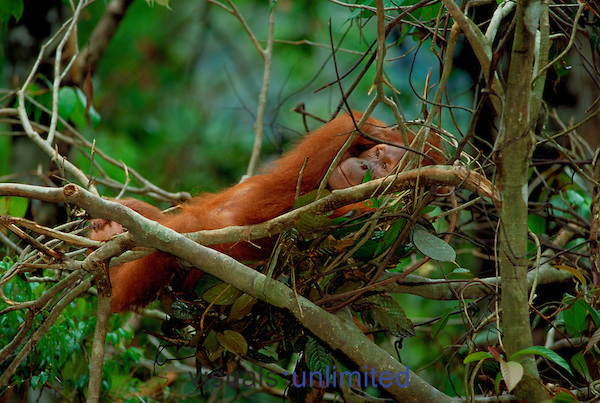 Did you know that orangutans spend 80% of the day resting in their nests? Or that if you give a young orangutan some branches, he or she will instinctively start to weave them together in a nest-like fashion, as an innate urge that exists whether or not they’ve been taught how to do it? I didn’t. Interdisciplinarity. I’ve written before about the amazing interdisciplinarity of biologists. It seems to be ingrained in the intellectual culture that you need people who know stuff you don’t know, obviously! And that culture just isn’t present within mathematics, at least not to anything like the same extent. For instance, this afternoon I went to a talk about the diversity of microbiomes. The speaker pointed out that for what she was doing, you needed expertise in biology, chemistry, and informatics. She was unusual in actually spelling it out and spending time talking about it. Most of the time, speakers moved seamlessly from ecology to statistics to computation (typically involving processing of large amounts of DNA sequence data), without making a big deal of it. The off-the-shelf culture. Some of the speakers bowled me over with their energy, vision, tenacity, and positive outlook. But no one’s superhuman, so it’s inevitable that if your work involves serious aspects of multiple disciplines, you’re probably not going to look into everything profoundly. Or more bluntly: if you need some technique from subject X and you know nothing about subject X, you’re probably just going to use whatever technique everybody else uses. The ultimate reason why I ended up at this conference is that I’m interested in the quantification of biological diversity. So, much of the time I chose to go to talks that had the word “diversity” in the title, just to see what measure of diversity was used by actual practising ecologists. It wasn’t very surprising that almost all the time, as far as I could tell, there was no apparent examination of what the measures actually measured. They simply used whatever measure was predominant in the field. Now, I need to temper that with the reminder that the talks are ultra-short, with no time for subtleties. But still, when I asked one speaker why he chose the measure that he chose, the answer was that it’s simply what everyone else uses. And I can’t really point a finger of blame. He wasn’t a mathematician, any more than I’m an ecologist. The lack of theory. If this conference was representative of ecology, the large majority of ecologists study some specific system. By “system” I mean something like European hedgerow ecology, or Andean fungal ecology, or the impact of heatwaves on certain types of seaweed. This is, let me be clear, not a bad thing. Orders of magnitude more people care about seaweed than nn-categories. But still, I was surprised by the sheer niche-ness of general theory in the context of ecology as a whole. A group of us are working on a system of diversity measures that are general in a mathematician’s sense; they effortlessly take in such examples as human demography, tropical forestry, epidemiology, and resistance to antibiotics. This didn’t seem like that big a deal to me previously — it’s just the bog-standard generality of mathematics. But after this week, I can see that from many ecologists’ eyes, it may seem insanely general. Unabashed politics. Mathematics is about an idealized world of imagination. Ecology is about our one and only natural world — one that we happen to be altering at an absolutely unprecedented rate. Words like “Brexit” and “Trump” came up dozens of times in the conference talks, and not in a tittery jocular way. The real decisions of people with real political power will have real, irreversible effect in the real world. Once again, this brought home to me that mathematics is not like (the rest of) science. It’s not just that we don’t have labs or experiments or hypothesis testing (at least, not in the same way). It’s that we can do mathematics in complete isolation from the realities of the world that human beings have made. We don’t have to think about deforestation or international greenhouse gas treaties or even local fishery byelaws. We might worry about the applications of mathematics — parasitic investment banks or deadly weapons or governments surveilling and controlling their citizens — but we can actually do mathematics in lamb-like innocence. On the other hand, for large parts of ecology, the political reality is an integral consideration. I saw some excellent talks, especially from Georgina Mace and Hugh Possingham, on policy and influencing governments. Possingham was talking about saving Portugal-sized areas of Australia from industrial destruction. (His advice for scientists engaging with governments: “Turn up. Have purpose. Maintain autonomy.”) Mace spoke on what are quite possibly the biggest threats to the entire planet: climate change, floods and heatwaves, population growth, and fragmentation and loss of habitats. It’s inspiring to see senior scientists being unafraid to repeat basic truths to those in power, to gather the available evidence and make broad estimates with much less than 100% of the data that one might wish for, in order to push changes that will actually improve human and other animal lives. On the brevity of Nature papers: my wife explained this to me recently. A Nature paper has a very short page limit, but may also have over 100 pages of supplementary material, which is online only. The printed part of the paper corresponds to the executive summary. The actual scientific paper is the supplementary material. The online supplementary material is certainly an important part of the picture. And even in less swanky journals than Nature, it’s quite common for the supplementary material to be longer than the paper itself. For instance, that was the case for the paper on diversity that Christina Cobbold and I published in Ecology. But the question is, how many people actually read the supplementary material compared to the article itself? Orders of magnitude fewer, I would guess. Actually, the criticisms of Nature that I’ve heard from biological scientists aren’t only about the brevity of papers. Another of the issues is that the editors are professional editors rather than working scientists. But the brevity is certainly a part of the problem, and feeds into the widespread perception that getting a paper into Nature is as much about salesmanship as science. Is this point about most people just reading the 3 page article and not the supplementary material any different from mathematicians often just reading the introduction to a paper? I think it is different. I have two reasons for saying this, both to do with peer review. Let me preface this by saying that unlike you, I’ve never published in (or even submitted to) Science or Nature, and I could probably count on two hands the papers in those journals that I’ve read. Nevertheless, other life science publications (including those that I’m more familiar with) do have this system of relatively short papers and relatively long supplementary material, although not usually in quite such an extreme manner. The first reason is to do with the formal reviewing process. Reviewers and editors seem to pay a lot more attention to the main text than the supplementary material. So, the appendices etc. are much less quality-controlled than the main text. It might be the case that referees of mathematics papers pay more attention to the introduction of a paper than the rest of it, but if it is, I don’t think it’s true to anything like the same extent. The second reason is about peer review in the broader sense: how the academic community responds to a paper after it’s published. If I read a short biology paper without reading or even downloading the supplementary material, I can truthfully say to myself and others that I’ve “read” the paper. But I’d never say that I’d “read” a mathematics paper if I’d only read the introduction. In journals such as Nature and Science, there’s such a sharp cut-off between the main text and the supplementary material (which you have to make a special effort to download), much more so than the distinction between the introduction of a maths paper and the rest of it. It seems to me that the format invites readers to judge the paper on the three-page “executive summary”, which raises obvious worries about scientific quality and progress. I thought of the same question as Simon. It seems to me that a 3 page executive summary + online supplementary material could be a very reasonable publication model. But Tom makes good points — it’s very much dependent on the extent to which referees and readers view the supplementary material as “real” content. I recently learned that Science (I think it was) is even doing one-page articles in their printed version, with other stuff online. That’s basically an abstract. Useless for actually doing science. The biggest complaint I believe is that any figures or data are shrunk beyond usefulness for omitted due to space requirements. However, the best use of supplementary materials I have ever come across is the authors including the whole of the published article as an extra pdf file, which is then freely available as all the rest of the supp. mat. is. Incidentally, I don’t have a well-formed opinion on the shortness of the talks at the ecology conference. I can see a lot of benefits, among them (i) that you can fit a lot of talks into a short space of time, and (ii) speakers are forced to stick to one main point, which isn’t necessarily a bad thing (though brings us back to the point made by Chomsky that I linked to in the post). 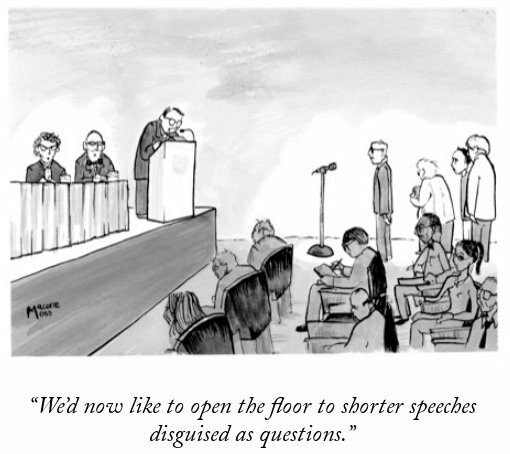 I sometimes think that it would be an interesting experiment to have 10 minute talks at conferences. And not just as some form of ghetto for PhD students, but rather for all levels of speakers. I’d want to avoid it just being some torrent of beamer slides, so either having it on blackboards or restrict to something like three beamer slides. The hope would be that people would try to convey a single point well. Of course, in the guise of a Catster I have experimented a bit with 10 minute gobbets of mathematics, but YouTube is a rather different medium to a live talk. PechaKucka is similar format that I’d like to see mathematicians experiment with. In that case you have 20 slides that automatically change every 20 seconds. It would definitely require a lot of effort by the speaker to think about what material to put into the different format, but I think a rethinking of how material is presented could have some interesting results. Sarah Koch organized a Pecha Kucha seminar in the Harvard math department a few years ago. If I remember correctly, there were six speakers — Sarah, Benedict Gross, Barry Mazur, Curt McMullen, Oliver Knill, and myself — and all of the slides were on a single timed PDF files, which meant we had only a minute or two between talks to make the transitions. That was fun! I spent the first 2 minutes 23 seconds wondering that you were adopting such a heteronormative framework without comment :-) I found myself making similar disclaimers when I was going through a phase of thinking about one of those combinatorial problems about dinner seating arrangements: how many ways are there of seating nn straight couples around a table, alternating men and women, such that no one sits next to their partner? Many, if not most, talks in sessions at the US JMM are only 15 minutes. Some are only 10. Oh really — that’s interesting. I don’t think I’ve ever seen a math talk that short. The prospect is quite appealing in a way. Do you think it works well? Looking at the actual schedule online, it looks like I was exaggerating a bit. I think the majority of talks in the “special sessions” (where organizers invite most or all of the speakers) are scheduled half an hour apart, which IIRC is usually interpreted as each talk being 20 minutes plus 5 or so for questions. (One or two big-name speakers may get an hour slot instead.) It’s in the “contributed paper sessions” that the talks are often scheduled 15 minutes apart, which I think means 10 minute talks plus maybe one or two brief questions. The 20-minute talks usually work reasonably well; there are no black- or whiteboards (the JMM takes place in a conference center or hotel), so everyone uses slides, and 20 minutes is just about enough to convey the bare bones of a mathematical idea to an audience who knows something about your field (which you can usually expect in a special session). I haven’t been to many contributed talks, but those I’ve been to have generally been less impressive, although of course there are selection factors operating as well as timing differences. Your field notes are very interesting. Thanks for sharing! I think it can be valuable to compare experiences in and see whether we can steal best practices from other academic disciplines. A few years ago I went to a conference at the National Bureau of Economic Research to see a working paper presentation The Big Sort: College Reputation and Labor Market Outcomes co-authored by my brother. It was an hour-long slide talk (with lots of charts and tables) during which the presenter spoke for maybe a quarter of the time. The rest was taken up by some might say hostile interruptions from the audience, who were doing their best to poke holes in the paper’s findings (“Did you take into account…?”). What I thought was neat about the format, however, was how much useful feedback the speaker received from the audience. The norm is to give a presentation like this while the work is still in the “working paper” phase, so that the paper that is submitted to a journal can incorporate all of these suggestions. Yeah, I can imagine how trying to imitate that in the math world might not be so easy. One feature of the ecology conference that I didn’t mention was the use of Twitter. The plenary lectures were given to an audience of a thousand or so, and if you wanted to ask a question, you had to do it in a suitably hashtagged tweet. At the end of each talk, the chair would select some of the questions and ask them. Keeping questions to 140 characters has obvious benefits, especially when the speaker is a big cheese to whom a certain type of participant might be tempted to show off. Ha, Twitter! That’s how I used to take questions (and answers) in big lectures. By the way I’d like to put in a word for using “they” as gender neutral third person pronoun, even for orangutans. There were six speakers and we each had 5 minutes to speak and 5 minutes to take questions. It was very daunting as there was a giant digital clock counting down the seconds in front of our face, and then when it hit 0 the organisers would hit a huge gong. I almost don’t believe you. That’s hilarious! Did they hit the gong even if you finished in time? I agree! I’m a big fan of “they” too. I see that when referring to a generic orangutan, I used “he or she” once and “they” once. Which is inconsistent of me. Maybe I was subconsciously using “he or she” rather than “they” or “it” to emphasize the closeness to humanity of orangutans. I have a soft spot for orangutans, and we’re slaughtering them to extinction. Today I learned that if you took a globally representative sample of 20,000 great apes, 19,999 of them would be humans. Only one would be a non-human great ape, and that last one out of 20000 would be split between the six other great ape species. All the other great apes are classified as endangered, most of them critically, which is the last step before extinction. The “hostile interruptions from the audience” format reminds me a bit of the Drinfeld seminar at UChicago, where (according to my memory of the few times that I went) the speaker would often only get through a fraction of their planned talk over the course of 2-3 hours. Usually I found this more frustrating than enlightening, though, since I actually wanted to hear what they had to say. the large majority of ecologists study some specific system. A differential equation wiki, not too dissimilar in spirit to the nLab, is the Dispersive PDE Wiki. It’s fascinating to read how specific things get, for instance at this list.